Hello beautiful people! 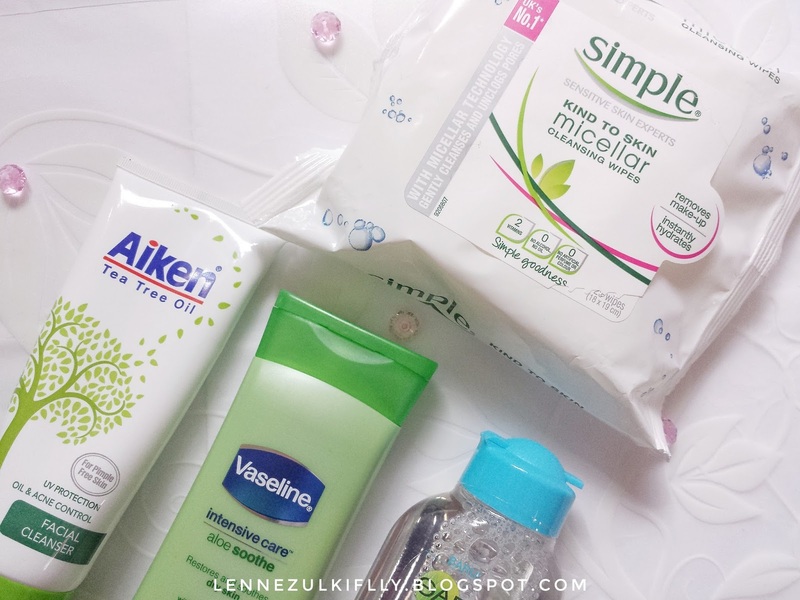 I'm going to show you the things that I bought about few weeks ago that is skincare related and inexpensive. You know how deep my love for drugstore items. I'm always on a budget, you guys know that. So if you're on a budget too, I hope this post helps you any other way. So yeah, hope you will enjoy today's haul and let's get into it! This is my first time trying this facial cleanser. I hope it works! I have read quite a lot of good reviews about it. Purchased it because it has tea tree oil in it and you guys must be aware of the amazing power of tea tree oil. However, I don't have acne prone skin but it surely is oily and I do get pimples and breakouts some other time every couple of weeks I would say, so I'm always in the hunt for a good oil controlling products. I have put it to the test for few weeks already since I bought it and I can safely say that I love it! It's very gentle on the skin and it has a strong tea tree smell to it. I love it but some people don't. The texture is thick and creamy and it foams up really easily. A little goes a long way with this product. I squeeze like a pea size every time I wash my face. So far, I'm satisfied enough. I didn't experience any breakouts or irritation on my skin. I really wanted this to work because I'm done searching for skincare items. Hopefully this will be my last search. This is also my first time trying this makeup remover wipes. All I can say is I'm loving this makeup wipes! I love the convenience of it and it doesn't irritate my skin too. It's formulated without alcohol that can upset your skin, so that's good. The wipes are not heavily saturated, they feel as if almost dry but they aren't. They manage to do a great job removing the makeup. I think it's reasonably priced for 25 wipes. What say you? I love it and I will purchase it again because it's so convenient! I sometimes come home late from work (usually 11 at night), I don't have enough time because once I got back, I need to get ready for school the next morning. So, that's when the makeup wipes comes in handy! I just pull one out from the pack, remove my makeup and I'm done. What a time-saver! Highly recommend if you're a busy bee or just lazy. I have talked about this product in my skincare routine post HERE, I'm still using it and will continue to use it because it makes such a darn good job removing my makeup. Like hundred percent, spotless. I'm really impressed with it, it doesn't break me out or irritate my skin. Overall just a great product. This has been a staple in my skincare routine and always been a constant for me. Totally a must have! I don't have any idea how much I have repurchased this baby. It has been my trusted and go-to lotion for a quite some time now. So, I have an oily skin on the face, right? But it's a different story for the rest of my body parts. I have a quite dry skin especially on my hands, arms, legs and thighs. This lotion is just a lifesaver for me. It's great for the hydration and moisture that my body needs. I love that the lotion is not sticky and greasy whatsoever. It leaves the skin feeling smooth and supple. And most noteworthy, it heals my dry patches that I have had (not by choice) for so long! Have you tried any of these products? 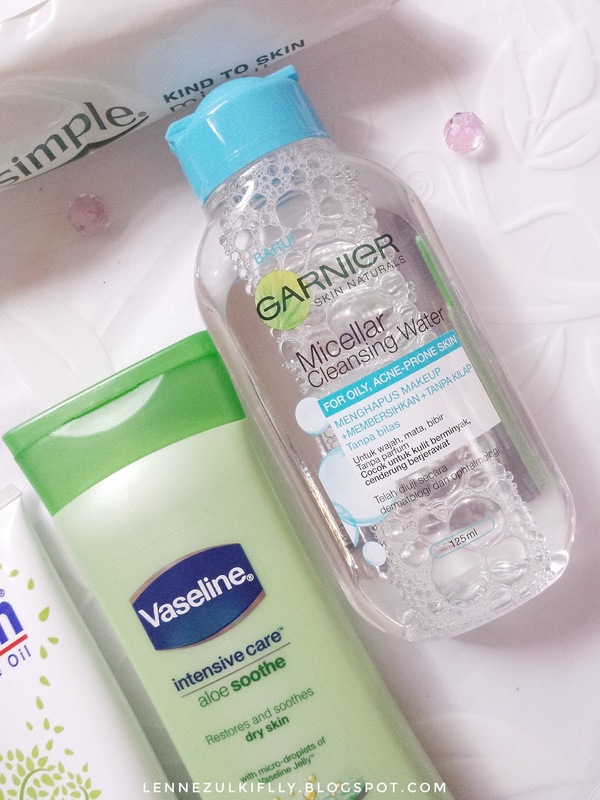 What is your favorite drugstore skincare product? i do love the aloe vera gel. used to be one of my favorites. 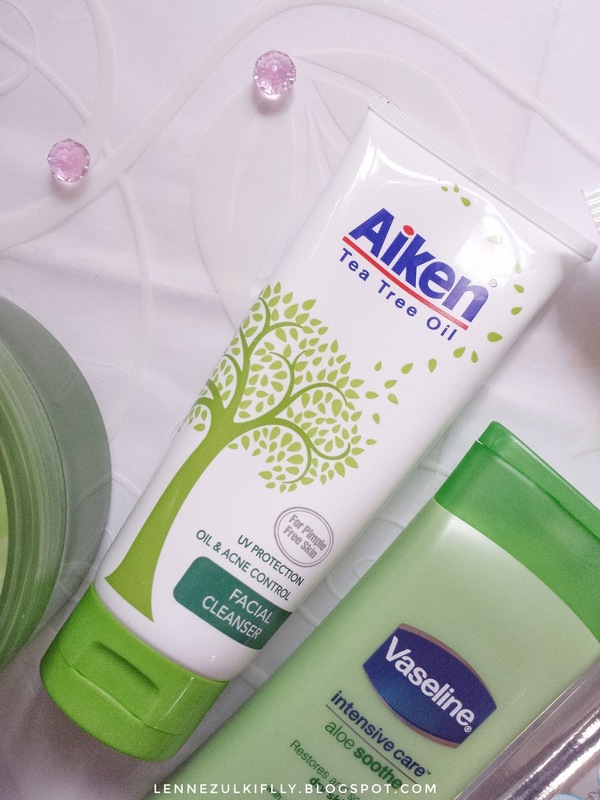 I used the Aiken Tea Tree Oil set before and totally loving the toner and moisturiser. Too bad that the cleanser didn't works well on my skin. I use both no 4 and 5. These two are the best. 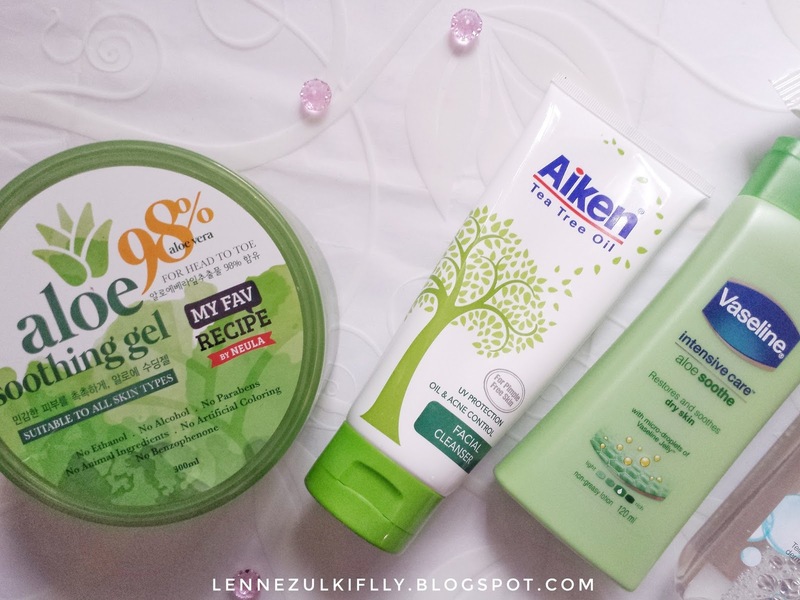 I used aiken products before, it really good for acne skin. but somehow it make my skin dry. i have combination skin. I actually have a friend who told me the same thing that the product dry up her skin and whatnot. And now she stopped using it. How about you? It's my holy grail! It suits my skin <3 Have you tried the new one that is infused with oil or something? The one in the yellow packaging. Kulit Fatin meragam awal bulan 12 baru-baru ni. Stop using any creams, just pakai krim ubat yang diambil di klinik je. Sekarang cuma pakai Cosmoderm Tea Tree Oil Cleanser je. Muka dah okay nanti baru sambung semula skincare routine kot. Huhu. 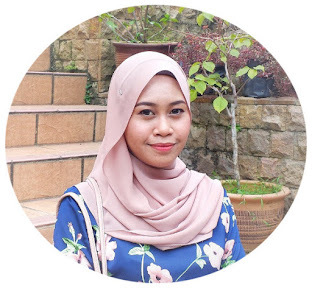 Fatin dapat rasa yang kulit muka Fatin ni macam kurang sesuai pakai whitening products. Naik jerawat besar yang dari dalam kulit tu.